This was Isaac Hayes's fourth studio album It followed again what was now a familiar path of lengthy soul workouts over sumptuous backing provided by the immaculate Bar-Kays. 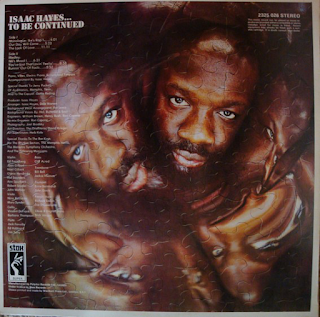 It was now the thing to do for Isaac Hayes - to issue soul albums with just a few long tracks on them. It really was ground-breaking. Nobody else was doing such a thing. Even The Undisputed Truth had a few shorter tracks alongside their epic numbers. The opener is a low-key spoken "rap", in which Isaac talks quietly over a subtle keyboard, bass, strings and drum backing. It merges into the slow grace of "Our Day Will Come". It is a slow-paced, smooth soul ballad with a deep, intense vocal. It finishes with a lovely bass-driven instrumental part. The eleven minute cover of Bacharach/David's "The Look Of Love" is just glorious. Backed with wonderful strings and horns, it is packed with classic soul atmosphere. Once more, Hayes's vocal is seriously underrated. He was rarely spoken of as a great vocalist, but he shows great versatility on all these early seventies albums The track also has a winning funky-ish instrumental break half way through, with delicious percussion, guitar and organ. Some punchy brass is joined by a funky wah-wah guitar before we get some blaxploitation soundtrack evocative parts to end with. "Monologue: Ike's Mood/You've Lost That Loving Feeling" is a fifteen-minute masterpiece that builds up slowly with some seductive orchestration and backing vocals. 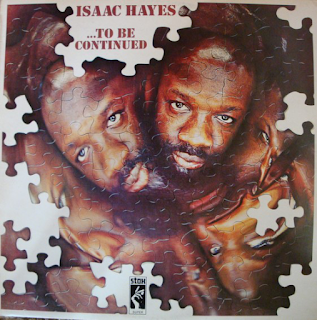 It is a long time before Hayes sings. Over six minutes before he launches into the well-known opening lines of The Righteous Brothers' anthem. Hayes's delivery suits the drama of the song. "Runnin' Out Of Fools" is another slow burner with Isaac soulfully singing over a gospelly backing vocal. Not as essential as "Hot Buttered Soul" or "Black Moses", but a ground-breaking and enjoyable album all the same.